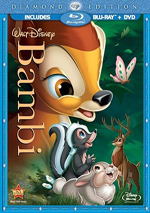 Bambi II appears in an aspect ratio of approximately 1.78:1 on this Blu-ray Disc. Across the board, the image looked great. No issues with sharpness emerged. At all times, the flick seemed crisp and concise, with nary a smidgen of softness to be found. No issues with jagged edges or shimmering occurred, and I noticed no edge enhancement. Source flaws were also absent. As with the first film, the palette of Bambi II went for a light, pastel sense of nature. Greens and other woodland hues dominated and looked very good. They were subdued to match the tone of the story, but they seemed clear and concise. Blacks were deep and firm, while shadows appeared smooth and distinctive. This was a totally solid transfer at all times. The DTS-HD MA 5.1 mix offered a broader soundfield than I expected. The sounds of nature spread nicely across the front and surrounds, and we got nice stereo separation for the music. The smattering of action sequences meshed together nicely as they utilized all five channels. In addition, the track presented a surprising amount of localized speech. Those elements popped up in the sides and surrounds with good definition, especially when Bambi thought he heard his mother’s voice. Across the board, the track offered solid quality. Speech was natural and distinctive, and I noticed no signs of problems connected to dialogue. Music was lively and dynamic, while effects seemed detailed and accurate. The mix featured very good bass response as well. This was a track that worked nicely for the movie. 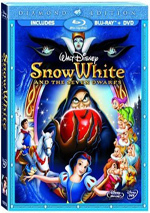 How did the picture and sound of this Blu-Ray compare with those of the original DVD? Both show improvements, especially in the visual domain. Audio was a bit warmer and more dynamic, but the picture showed the most impressive gains. The old DVD looked fine, but the Blu-ray was significantly better defined. All of the DVD’s extras reappear here and we get new components as well. Under “Games and Activities” we find Thumper’s Hurry & Scurry. This offers a “hide and seek” style contest in which you hunt and peck to find Thumper in the forest. I suppose it could be more tedious than it is, though I find that tough to imagine. Many Disney releases come with these lame guessing games, but this one’s more annoying than most. “Backstage Disney” presents two components. The Legacy Continues offers an eight-minute and 17-second featurette. It features the usual mix of movie clips, behind the scenes bits, and comments. We hear from Deja, producer Jim Ballantine, director/writer Brian Pimental, art director Carol Kieffer Police, unit director Alexs Stadermann, unit producer Debbie Cramb, supervising animator Pieter Lommerse, and actors Patrick Stewart, Brendon Baerg, and Alexander Gould. The show looks at challenges involved with an update of a classic, animation research and other visual choices, and the voice acting. Next we find the two Blu-ray exclusives. Friend Owl’s Forest Fun Games delivers three mini-contests. The first offers simple questions that require you to identify flower bunches, while the second asks you to keep track and count animals. Finally, the last one offers simple math questions. Games one and three are tremendously easy, while game two is pretty tough; the math involved is simple but it throws so many different critters at you that it’s difficult to actually remember them. None of these are much fun. A Deleted Song called “Sing the Day” runs two minutes, 16 seconds. It depicts the cut sequence via audio and a mix of film footage and storyboards. It’s pretty forgettable. The disc opens with ads for SpookyBuddies, The Lion King, and Tinker Bell and the Pixie Hollow Games. These also appear under Sneak Peeks along with promos for Prep and Landing: Naughty Vs. Nice, The Lion King on Broadway, Dumbo, Lady and the Tramp, DisneyNature: African Cats, Secret of the Wings and Beauty and the Beast: The Enchanted Christmas. 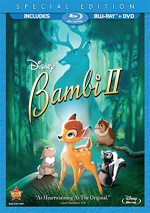 No trailer for Bambi II appears here. A second disc offers a DVD Copy of the film. This gives us a retail version of the DVD, not a neutered one. That makes it boast value. Some folks regard Disney’s direct to video sequels as an abomination, but I really try to go into them with an open mind, especially since some of them have been pretty entertaining. Unfortunately, Bambi II is nothing more than fodder for the DTV foes. Formulaic, predictable and trite, it never remotely lives up to the legacy of its predecessor. The Blu-ray provides terrific visuals as well as good audio and a mediocre set of supplements. I like the presentation of the flick but find the movie to be a bore.